Every year around Thanksgiving, there's a story that gets passed around about a certain brother D as a warning to everyone else on what not to do... And since this story will invariably get passed around again, I decided to preemptively write about it here, speaking in the first-person perspective. Many years ago, my wife S and I had the honor and privilege of cooking a turkey for our group. 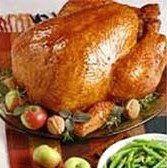 I bought the turkey 2 days before the cooking day, hoping that it would be enough time to thaw in the refrigerator. But when the time came, I realized that the turkey was still frozen solid in various spots -- which meant that I was in trouble. I thought for a moment about what I should do, and then came up with a brilliant solution. In a mere 30 minutes, the turkey was thawed, and after 4 hours, I had one of the best-looking turkeys of Thanksgiving Celebration. Beaming with pride, I called wife S and said, "The turkey was still frozen when I took it out of the fridge. But guess what I did!" "I blow-dried it and then put it next to our room heater! And boom! It was thawed in like 30 minutes!" There was a brief silence, and then she said, "Uhh... I'm not sure if you were supposed to do that." Then I heard her speaking with some other sisters on the other side of the line, and then I heard a great number of sisters laughing and screaming in the background. They told me that I needed to just throw the whole turkey away. But the turkey looked so beautiful that it seemed like a waste to just throw it away. Supposedly if you do that to any poultry, one who eats it might get this thing called salmonella poisoning, which could possibly cause some minor symptoms like stomach cramps, fever and death. I tried to argue that maybe this turkey could be used as a "display turkey", but they wouldn't have it, just in case someone takes it and eats it. So I had to throw the whole turkey away. To this day, I think that turkey was the best-looking turkey ever made in Gracepoint Fellowship Church. It had that perfect brown skin all over without a single burnt spot, which I was never able to reproduce since. Perhaps its perfect brownness was because I had warmed it up nice and toasty next to the heater for 30 minutes, but no matter -- it was still the most beautiful turkey ever. I sometimes wonder, what if I didn't brag about my turkey to my wife over the phone? That's why I think it's useful to brag sometimes, as long as you're okay about being humiliated by the laughter of a multitude of sisters. Note: For a good way to cook turkeys, check out Tom Kim's dishgracepoint site, where he posted a great turkey recipe called "Gracepoint Turkey Recipe"! I'm going to join Kevin Limk in imagining Sarah's face as Daniel is telling her this. A certain Brother D... Speaking in a first-person perspective... That Brother D couldn't possibly be the same Brother D of Disgracepoint ownership fame?